Click on "Software Sources", then enter your password when requested. A new window will open, there you go to the folder Named "Other Software"
Find the line that says google something and unselect the line. There will be an option to remove it in the lower right of the window, just click on it, then close the window by clicking on the Close" button at the lower right of it. You will now have a pop-up that tells you your sources list is out of date (which is a normal procedure as you just removed a source list), click "Reload", then a progress-bar window will open and reload the sources list. Once this is done, click the "Close" button on it. On Discover, you now go to the "Upgrade" option and do your upgrade. Just make sure you do not have the laptop go into sleep mode while this happens (I gather you have disabled this by now in the System Settings). You can use your computer while it updates in the background, it will just be a bit sluggish on some actions, but an upgrade can run in the background without problems. You will be prompted to reboot your laptop once this is done. the refreshing of the system took the best part of the night, no data losses. 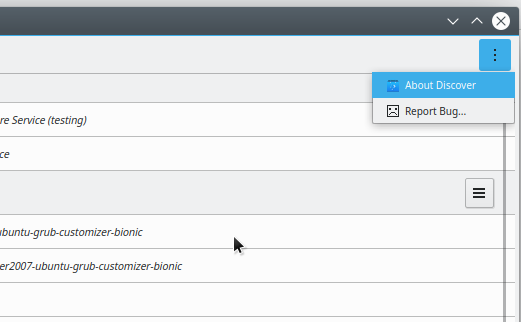 Now, I went into Discover, clicked settings and got a list with bionic and missing backends. No such a folder as software source or so. I'd give you a screenshot, but that's to hard for me to accomplish. Even after the night long refurbish which seems to have gone well there is no reaction if I click on update. Please read my post again carefully, you tend to skip lines apparently. There certainly is an option "Software Sources" in Discover, and it is not a folder but a button (top right normally), the folders are in the new window that opens once you have entered your password. My Discover version is 5.14.5, on Kubuntu I see a "Software Sources" button next to that menu button. The line title is "Ubuntu" as those are the main servers providing me with updates. Nothing there either, just disabled Make Default. I'm not seeing any other buttons on the Settings page. Maybe I'm missing a package that adds that button? Maybe the button isn't there on KDE Neon (I don't have Kubuntu). Looks like a bug to me, then, there definitely should be an option to edit the sources. KDE neon User Edition, too. Are these installed and up-to-date? 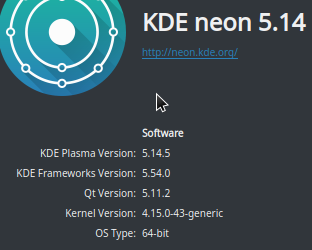 I have KDE Neon installed on three computers - none have a Software Sources button (the same as the images I posted previously). Two were installed from the 18.04 2018-12-20 ISO (both fully updated), and one from the earlier 16.04 2018-07-05 ISO later upgraded to 18.04 (and probably still at 5.14.3 because it hasn't been updated in a while - it's the wife's computer). The first command you posted had no output, which was due to the final grep command not working because the '+' character needs to be escaped with a '\' (maybe I have bash configured differently via .bashrc). All those packages are installed. This is not really an issue for me (I can get to the software sources from either the Synaptic Package Manager or by editing the etc repository files directly from the terminal), but this may explain why the OP doesn't see a Software Sources button on his system. this may explain why the OP doesn't see a Software Sources button on his system. WHAT may explain … ? I reread it twice. I can't follow. Sorry. And thanks for additional data, by the way. The OP couldn't find the Software Source button. I thought I would try to help him find it, but when I looked, I couldn't find it either. This could explain why he couldn't find it, because it's not there (at least it doesn't appear to be on my systems). "pkcon refresh" + "pkcon update"
I think, I have to give up, for now.